If you’re looking for large family meal planning ideas, you’ve come to the right place. I’ve done lots of slow cooking, budget friendly meals and freezer meals this week. This week I have avoided the grill after this happened last week. Entire dinner up in flames. Ready to see what we’re making this week? Slow Cooker Lentil Tacos– my kids love this. You can get a bag of lentil for a buck. So good!! They cook in 4 hours on high in the slow cooker. Sesame Ginger Chicken– served with broccoli, brown rice and a salad. So good!! This is also one of our freezer meals for the month of August. So good! If you watch our freezer assembly video I adding extra sesame ginger sauce and chicken to the freezer bag so I have about 3 breasts left. I am going to freeze the leftover chicken and use it later for stir fry another week. Beans and Cornbread– again another super cheap meal. I do add some things to my beans with I cook them in the slow cooker. It’s a recipe I’ve been making for years. So good!! The 4 year old and 2 year old eat this stuff up!! Slow Cooker Chicken Cacciatore– another meal from our August freezer meal plan. We assembled it with thighs- you can do drumsticks or breasts. Serving this with pasta and a veggie. Taco Soup– using up some of the leftover pinto beans and some ground beef I bought for half off last week and put it in the freezer. One way that I save on my grocery budget is shopping online with free grocery pickup. I do not pay for the service and it’s great to know the total of what you’re spending BEFORE you check out. Need to remove some things from your cart? No worries. I also love that I do not have to get my kids out of the car to shop and online shopping prevents impulse shopping. It’s a win, win!! If you have never given online grocery shopping a try, it is such a lifesaver for moms. I just cannot say this enough. Not only does it help me stay on budget, but I don’t have to wrangle kids while grocery shopping. I literally load up my kids, tell the Walmart app I am enroute, pull up, they come out and load me up and I am done!! You have to try it! And get $10 off your first order of $50 or more! Did you see our freezer meal assembly for the month of August. Here are the seven meals we assembled in less than an hour. They are all perfect for back to schooL!! Grab our August Freezer Meal Plan and assemble seven meals in less than an hour! Perfect for back to school time! It is still super hot here in Texas. Here are 21 recipes that are perfect freezer meals for when you it’s too hot to cook. 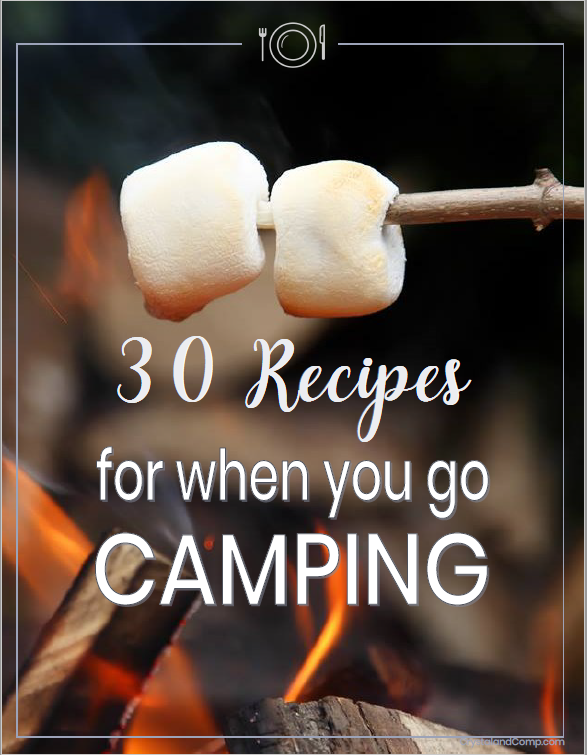 All of these recipes are made in the slow cooker, on the grill or on the stove or electric skillet. Nothing that heats up the house! We spent all of last week traveling and eating with family out of town, but this week we are back on the large family meal planning train! Each week I share with you what I am feeding my large family of eight. We have six children at home from teen all the way down to a toddler. All of our kiddos at home are boys… so they basically eat us out of house and home. 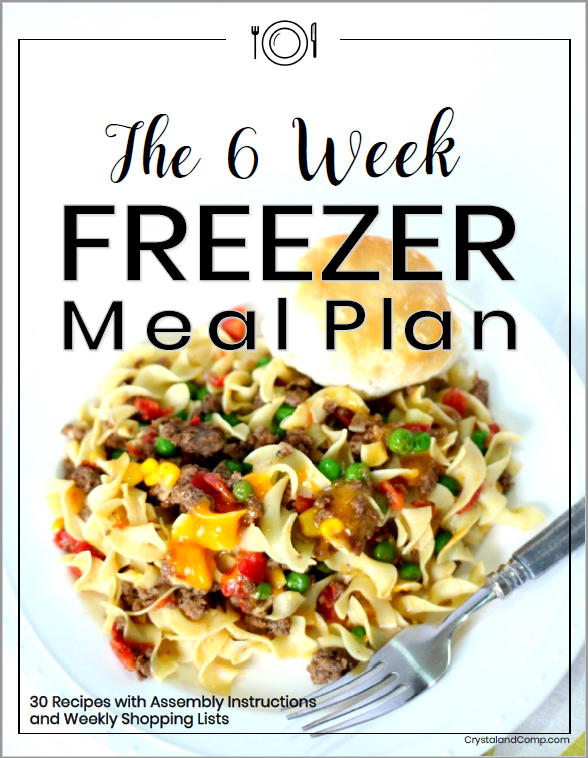 Not only do I meal plan, but I keep my freezer full with make ahead freezer meals. Each month we share new downloadable recipes over on Get Dinner on the Table. You should check them out! Here is what’s on our menu for this week. It’s still super hot here in North Texas, so we are using the slow cooker, Instant Pot and grill as much as possible! Garlic Mustard Grilled Chicken– literally, I pulled what I had out of my freezer and pantry. I had chicken breasts in the freezer so I put 7 of them into a gallon size ziplock bag. I added 4 T of whole grain dejon mustard, 2 T of olive oil, 2 cloves of minced garlic, 1/3 cup of honey, some Mrs. Dash and some dried onions. Marinate it all in the bag for 4-6 hours. My chicken was frozen so I did this on the counter, but if your chicken is already thawed you can marinate in the fridge. I am serving this with steamed broccoli and salad. One Pot Spanish Rice– I LOVE this meal. It is so good. It is a meatless meal and so thrifty. It cooks all in one pot and leaves minimal cleanup. I don’t make this enough… needs to be on my meal plan once a month! Chicken and Rice Casserole– making this on the grill. I am serious!! I have some chicken already shredded up in the freezer that was leftover from dinner a while back. I also have leftover Knorrs Broccoli Rice (I am NOT working with them) from the other night. I made four packets and it was way too much, so I froze the leftovers in a ziplock. (Have you ever tried this rice? I used to make it ALL THE TIME back in my 20’s when I first started cooking. I think it was Lipton brand back then…). I am going to mix the shredded chicken, the leftover rice mix and put it in a disposable metal pan. I will use a little chicken broth to think it up a bit, if needed. I am going to top with shredded cheese and cover in foil. I will put it on the grill and heat it up. I just cannot use the oven this time of year- it heats our house up way too much. What an easy way to use leftovers and think outside the box, right? I will serve this with salad and a side of strawberries and blueberries. Grilled Pizza– I have four pizzas in my freezer from our June freezer meal assembly. Two cheese and two pepperoni. If you’ve never done this before, now is the time to try it!! One things that is my saving grace for meal planning every week is ordering my groceries online. I literally open a window with my grocery list and a window for Walmart. I can see exactly how much I am spending and take anything off the list before I check out if I feel like I am going over budget. It keeps me from impulse shopping and adding unneeded junk to the basket, like cookies and candy. No totting kids into the store for buying groceries ever again! If you use my link to place your first order, you get $10 off and so do I! Make ahead meals have literally changed dinnertime at my house. Our August Freezer Meal Plan is in the shop. Head over and see all of the recipes that are included. These are all of the things I love that help me get dinner on the table each week. Have you thought of meal planning? It is seriously the secret to kitchen success! No matter the size of your family you can accomplish feeding your family with little prep. After all families just want dinner around the table. These meal planning must haves are what we like to keep on hand when assembling freezer meals. 1. A Sharpie is a necessity for labeling the meals you prep so you know what is in the freezer. 2. Make sure you have gallon size freezer bags on hand for storing your meals. 3. A roll of foil is great for covering throw away casserole dishes tightly. 4. Some recipes may need parchment paper to prevent sticking when cooking. 5. Freezer bag holders work for assembly but also soups, sauces, and other chopped favorites. 6. We love this collapsible colander that works wonders for rinsing veggies and fruits prior to assembly. 7. If you run short on time you can defrost just about anything in a jiffy with a thaw board. 8. These freezer casserole dishes are just right for casseroles and such and they work well in the freezer with no worry for shattering. 9. Meal Prep Containers are great if you assembling smaller portions for smaller families or just a quick easy meal. 10. Glad Ovenware is a disposable option for freezer meal assembly. 11. When prepping you have to have measuring cups and measuring spoons help for adding all the right ingredients. 12. A slow cooker is a saving grace for whipping up those meals you have assembled. 13. My instant pot is the quickest and easiest way to cook in no time. 14. Having a good sized stock pot on hand makes for boiling things up pretty easy. 15. We love these baking sheets for those delicious sheet pan dinners! 16. Keep mixing bowls counter top for mixing marinades and veggies. 17. We love these cutting boards for assembling because they have handy labels for what they are used for. 18. A set of sharp knives makes for chopping super simple! 19. If you are storing away seasoned meat or other items use a Foodsaver to make things freezer friendly. 20. Having a kitchen timer on hand is wonderful for keeping track of multiple tasks while you are prepping. 21. We like to precook ground beef and other things in a saute pan prior to assembly. 22. You can shred, chop, and puree just about anything when using a food processor like this one. 23. If you are measuring out foods for healthy reasons or precision a kitchen scale is perfect! 24. Slow cooker liners are easy to use for cooking and keep your crockpot clean. 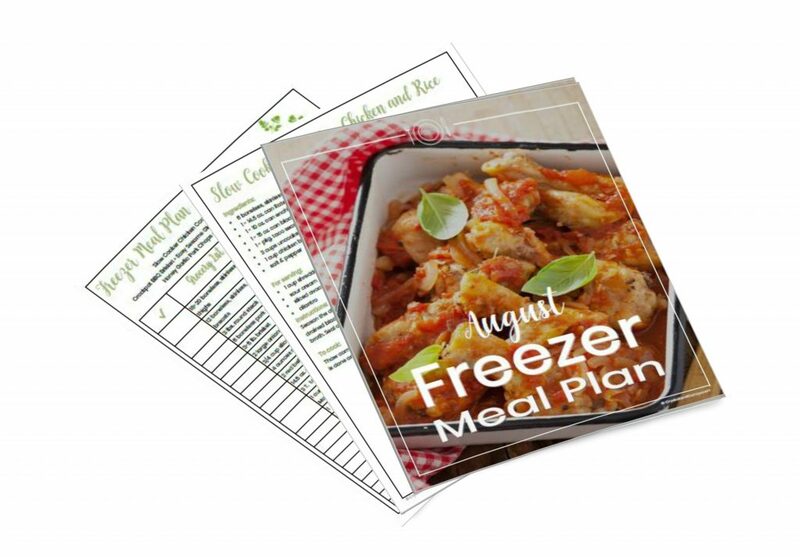 We have been working hard every month to create a monthly meal plan that stock piles the freezer with easy meals families love. Each month brings something new and exciting. Join us over in our Get Dinner On The Table group on Facebook for lots of other meal ideas, tips, and humor! 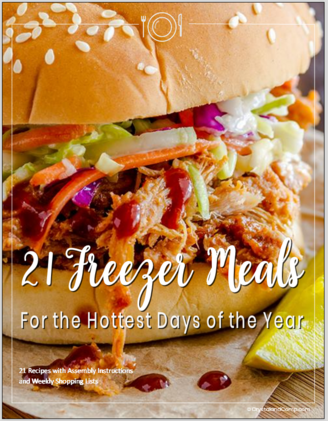 You can see all of the make ahead freezer meal plans, It is definitely something you aren’t going to want to miss!